'The three greatest composer who ever lived are Bach, Delius and Duke Ellington' - Percy Grainger at a New York University lecture in 1932. 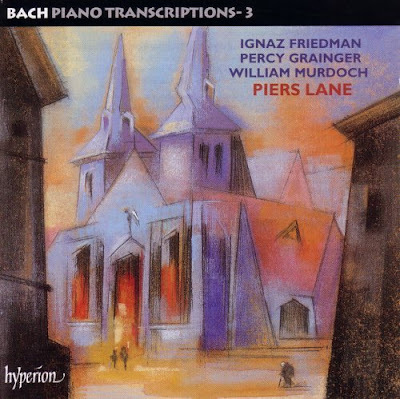 Four of Percy Grainger's Bach transcriptions, including the mighty Toccata and Fugue in D minor, feature on Pier Lane's CD of Bach transcriptions seen above. 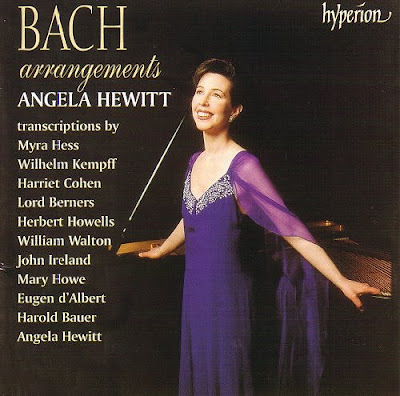 Angela Hewitt has also recorded a disc of Bach transcriptions for Hyperion which is seen below, although this does not include any of Grainger's. Angela Hewitt is directing the Britten Sinfonia from the keyboard in Bach's Keyboard Concerto No.5 in F minor BWV 1056 in concerts in Cambridge, London and Norwich on April 1, 3 and 4. Also in the programme is Dmitry Sitkovetsky's rarely heard transcription for chamber orchestra of the Goldberg Variations, with Tom Gould leading and directing the Britten Sinfonia. Before the Norwich concert on April 4 I will be asking Angela Hewitt and Tom Gould the save 64 million dollars a year question - who needs a music director?. There is a lot of fine and little known Delius waiting to be discovered including his double concerto for violin and cello and his concerto for solo cello. Sir Charles Mackerras made a notable EMI recording of those two concertos with soloists Tasmin Little and Raphael Wallfisch. It is still available, but move quickly. And completing Percy Grainger's trio of the greatest composers, there is a straight talking Duke Ellington here. This is an early heads up for the April concerts as posting will pause in March while we travel in the Mahgreb, the political situation permitting. Header quote from Percy Grainger by John Bird (ISBN 0571117171 - OP). Any copyrighted material on these pages is included as "fair use", for the purpose of study, review or critical analysis only, and will be removed at the request of copyright owner(s). Report broken links, missing images and errors to - overgrownpath at hotmail dot co dot uk Also on Facebook and Twitter. I don't know the Sitkovetsky transcription of the Goldberg Variations, but the one by Bernard Labadie, performed by his chamber group, Les Violons du Roy, is one of our very favourite recordings. There is also a transcription of the Goldbergs by Dmitry Sitkovetsky for string trio. I recall a commercial CD of it being issued but a quick search draws a blank. The Sitkovetsky version has been recorded at least twice, first by Sitkovetsky, Gérard Caussé, and Misha Maisky (Orfeo), and later on DG (now available at arkivmusic.com) by Julian Rachin, Nobuko Imai, and Maisky again. For completeness I should also point out the Sitkovetsky version for chamber orchestra is available on Nonesuch with the NES Chamber Orchestra led by Sitkovetsky and with sleeve notes by John Adams. The link in my post points indirectly at that recording. As well as the Orfeo and Nonesuch releases, I also have a recording of the Sitkovetsky version by the Gaede Trio (Thomas Selditz, Felix Schwartz and Andreas Greger) on Tacet. I would strongly recommend a new accordion transcription by Theodoro Anzellotti released late last year on the Winter & Winter label. Also only Bernard Labadie transcription, I would love to delve into the Sitkovetsky. I should also put in a good word for Herman Scherchen's Art of Fugue orchestration - old-school brilliance. I've never used the names Bach, Delius and Ellington in the same sentence: Bach and Ellington, perhaps - but Delius, not. And my thanks to you for pointing us to this interesting statement by the eminently "eccentric" Percey Grainger.